State Election Commission has found nine articles in local newspapers as "paid news" during Chhattisgarh assembly polls and directed that expenses incurred in publishing them be added to poll expenditure of parties and candidates concerned. As per directions of Election Commission-constituted Media Certification and Monitoring Committee, expenses incurred in publishing seven "paid news" before filing of nominations for the second phase of polls yesterday, will be included in the poll expenditure of Bharatiya Janata Party and Congress party. Besides, expenses incurred in publishing two items which were identified as paid news after filing of nomination, will be added to poll expenditure of a ruling party's candidate. An expense of Rs 66,080 will be included in poll expenditure of BJP while Rs 2,510 to the Congress. Apart from that Rs 35,322 will be included to the election expenses of BJP's candidate from Raigarh constituency Roshan Lal Agrawal, said Collector Mukesh Bansal, who is also MCMC chairman. 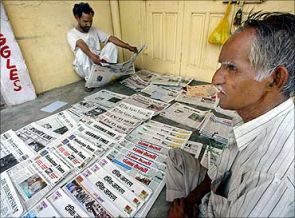 According to a non-government member of the committee, Vijay Kedia, news published in four local Hindi newspapers -- Jankarm, Dainik Kelo Pravah, Ispat Times and Dainik Krantikari Sandesh -- were in favour of Congress candidate Shakrajeet Nayak and BJP nominee Roshan Lal Agrawal, who are both from Raigarh constituency. Of the nine articles published, four pieces appeared exactly in the same format in all the four 'newspapers', with the same heading, he said. After examination, MCMC categorised all these news articles as paid news, he said. Is Vasundhara Raje avoiding Modi?